If you’ve found Port Townsend Coffee Roasting Co., you probably love coffee so much that you seek out the best tasting, Certified Fair Trade Organic coffees available. You’ve probably been around coffee for years, perhaps starting with Specialty Coffees in the 1980’s, and know your way around fairly well. How and where coffee is grown and harvested, how it’s roasted, how to brew it. You value fair, guaranteed wages for growers and sustainable stewardship of the land where it’s grown. No matter how much you drink, if you’re like us, great coffee is an important perk in your life. You are not alone in this… coffee is the one of the world’s most heavily traded commodities. In addition to the impact it has as a crop on the economies of producing countries, the cafe and coffee house industry touches millions of lives everyday, worldwide, as well. We love the place coffee takes in conversation, culture and commerce. We seek out the world’s rarest coffees for taste and consistency. We roast and blend coffees at Port Townsend Coffee Roasting Co. with the hope that you will enjoy every cup. Michael roasts in a European style, specifically similar to that of central Italy. The blending and roasting process determines the flavor and body of the coffee equally as much as the kinds of beans used. Italians are noted for their blending skills. 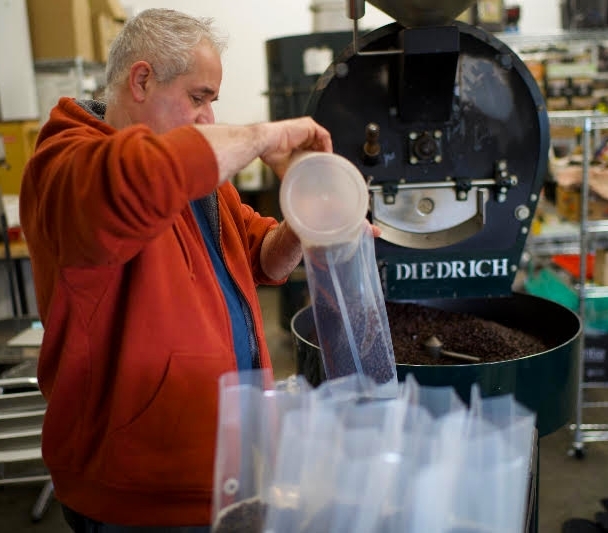 Your Coffee Primer: what gives Port Townsend Coffee its qualities? We roast Port Townsend Coffee in small batches (under 3o lbs), engendering uniformity in the roast level. Coffee roasted in big batches may be unevenly roasted. Port Townsend Coffee is air cooled, as opposed to water cooled. Many of the larger roasters must spray water on the coffee as it comes out of the roasting chamber, to cool it down. This affects the quality of the coffee and its ability to remain fresh if the water is not properly evaporated by the heat from the coffee. We roast our coffee much more slowly than most roasters, especially coffee roasters in the Pacific Northwest. The slower roasting process allows for greater bean development. The bean is evenly roasted right to the center and our process mutes some of the acidic compounds, which smooths out the flavor. Port Townsend Coffee is known for roasts that are darker than others available in the Northwest. Due to our roasting process, which emphasizes patience with the beans as well as air flow adjustments, the darker roasts are smooth and syrupy. Dark roasts from other companies can taste bitter, or slightly burnt due to the size and speed of the roast. We have been buying beans from the same brokers for many years. They understand the flavor profiles we prefer and seek to accommodate our needs. We pay a steep premium for these beans, which are typically from smaller farms that are organized into co-ops. These farms take pride in their coffees, as the farmers make a living wage and their families are able to live in a healthier, more secure environment than farmers who grow a conventional coffee crop. The quality of our coffee is consistent, in part due to the quality of organic and fair trade beans. At Port Townsend Coffee, we roast a batch and within 15 minutes, package it in one-way valve bags so the coffee can “de-gas.” The valve allows the gas to escape, but prevents oxygen from coming into contact with the coffee (oxygen causes coffee to go stale). Many roasters allow their coffee to ‘de-gas’ by holding it in large bins for several days before packaging it. This procedure can cause the taste to go flat. 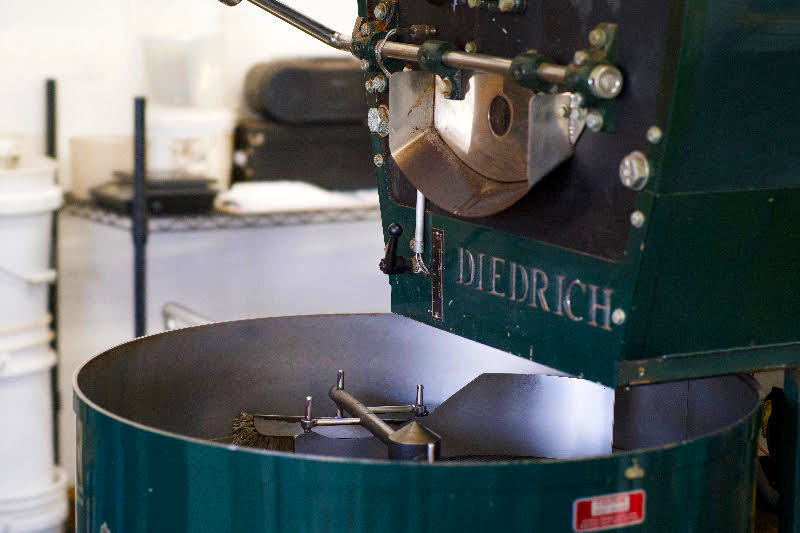 We have used 5 different Diedrich Coffee Roasters since 1985. Compared to other machines, they produce an evenly developed roast. The infrared burners are much gentler than the direct flame burners on most other roasters, and the air flow control give a greater range of what can be done for the beans. Fresh coffee is better! We use one-way valve bags to the coffee is flushed with protective carbon dioxide and protected from the deteriorating effects of oxygen. The best coffee is fresh from the roaster; however, the coffee in our valve bags keeps its flavor intact for a month without a perceivable taste difference to most people. We recommend you buy enough coffee for a one-month supply. Keep it in the valve bags, in a cool place—such as a lower kitchen cabinet. Once the bag is opened, keep air out by rolling down the top of the bag and secure with a rubber band. Remember, air (oxidation) will cause your beans to go stale! We also recommend you buy whole beans and get yourself a coffee grinder. Grinding exposes much more surface area to oxygen. Last, never put coffee beans in the refrigerator or freezer, as this speeds up oxidation. Michael pours beans into the roaster.